Collector of Customs Hiram Barney was a political ally of Salmon P. Chase — which made him an enemy of New York political boss Thurlow Weed, who editorialized in 1864: “The organization of the New York Custom House is a living, burning disgrace.”1 After President Lincoln and Secretary of the Treasury Salmon Chase appointed Barney as Collector of the Port of New York, wrote biographer Alonzo Rothschild, he became “a veritable germ of irritation. He was one of Chase’s most valued supporters. As a political lieutenant, Barney had, in years gone by, won the Radical leader’s good will; as a friend, he had by his private kindnesses laid that gentleman, more recently under heavy and somewhat peculiar obligations.”2 His friendship with Chase was both an advantage for Barney — and the cause of political controversy during the Civil War. Barney had supported Mr. Lincoln at the May 1860 Republican National Convention when he realized that Chase was out of the running for the presidential nomination. Barney subsequently raised $35,000 for the national ticket. When Thurlow Weed visited President-elect Lincoln in Springfield in December 1860, he was told: “I have not promised an office to any man, nor have I, but in a single instance, mentally committed myself to an appointment; and as that relates to an important office in your State, I have concluded to mention it to you, under strict injunctions of secrecy, however. If I am not induced by public consideration to change my purpose, Hiram Barney will be Collector of the Port of New York.”4 Barney himself was part of a New York delegation that visited Mr. Lincoln in Springfield in January 1861 to urge Chase’s appointment to the Cabinet. The impact of Barney’s appointment was felt immediately. “The New York custom-house had long played an important part in national and state politics. The patronage under Barney’s control was very large,” wrote historian Sidney David Brummer. “He was for days deluged with applications for places, the custom-house was thronged with eager seekers for positions, and many persons visited the rotunda merely to witness this spectacle. Subordinate places to the collectorship were given to two other prominent New York radicals, Rufus Andrews (appointed surveyor of the port) and Henry B. Stanton.”11 (Stanton was a prominent abolitionist and husband of feminist leader Elizabeth Cady Stanton. Andrews was an attorney who had developed a relationship with Mr. Lincoln before his election as President and whose appointment was supported by the Tribune‘s Horace Greeley.) Although Barney was seen as Chase’s appointment, he maintained good relations with other Cabinet members and helped to smooth over difficulties between Chase and William H. Seward concerning the reappointment of Assistant Secretary of the Treasury John A. Cisco. 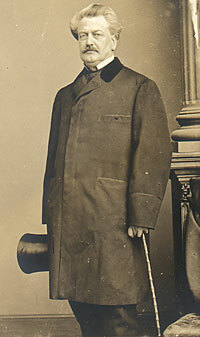 Biographer Albert Bushnell Hart wrote that Chase “resisted the piteous appeals of his friends to reorganize the Custom House in New York and other important offices. Collector Barney had many enemies, who worked upon the President to remove him; yet, in a place where the temptation was strong and the power unquestioned, Chase forbore to use his patronage for his own advantage, and thereby he incurred the reproaches and even the scorn of some would-be supporters.”18 The conflicts grew so great that Barney himself asked to be replaced. A contributing factor was the arrest and imprisonment in Fort Lafayette of a top Barney aide, clerk Albert.M. Palmer, on charges of aiding and abetting dealings in contraband. The loyalty to Barney and to Barney’s assistant came at considerable cost to Chase and Mr. Lincoln — in Congress and in the press. “As the time, however, for the next presidential canvass drew near, the attacks upon him grew fiercer than ever. They presently developed into charges of corruption and incompetency, which a Congressional Committee undertook to investigate.”23 Barney was further bedeviled by an investigation by the House Committee on Public Expenditures into the contraband activities of Henry B. Stanton and his son. Barney’s position was undermined by the actions of a Chase lieutenant, Joshua Bailey, who was supposed to investigate corruption in Barney’s Customs operations but told the congressional committee investigating him that “whatever might be developed the President would take no action.”30 Furious, Mr. Lincoln wrote Secretary Chase about Bailey: “I have felt considerable anxiety concerning the Custom House at New-York. Mr. Barney has suffered no abatement of my confidence in his honor and integrity; and yet I am convinced that he has ceased to be master of his position. A man by the name of Bailey, whom I am unconscious of ever having seen, or even having heard of, except in this connection, expects to be, and even now assumes to be, Collector de facto, while Mr. Barney remains nominally so. This Mr. Bailey as I understand having been summoned as a witness to testify before a committee of the House of Representatives which purposed investigating the affairs of the New-York Custom-House, took occasion to call on the Chairman in advance, and to endeavor to smother the investigation, saying among other things, that whatever might be developed, the President would take no action, and the committee would thereby be placed unpleasantly. The public interest can not fail to suffer in the hands of this irresponsible and unscrupulous man. I propose sending Mr. Barney Minister to Portugal, as evidence of my continued confidence in him; and I further propose appointing ____ Collector of the Customs at New-York. I wrote the draft of this letter two weeks ago, but delayed sending it for a reason which I will state when I see you.””31 The President was right. It turned out that Bailey was more corrupt than the people he was investigating; he eventually fled to avoid prosecution for embezzlement. He read it over, carefully once or twice and then said he did not quite understand it. He had written a letter to Judge Davis which the Judge had probably show you, but in that he had said nothing about Custom House matters. In late August John G. Nicolay was dispatched to New York to make the necessary job shifts. After a conference, Barney submitted his resignation. 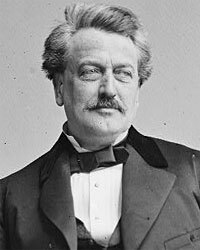 Simeon Draper, whom Chase biographer John Niven described as “Weed’s whimsical bagman,” was named to replace Barney.51 Barney remained loyal to to Chase — serving on a presidential organizing committee in 1868. He was at Chase’s side when he died. Reinhard H. Luthin, The Real Abraham Lincoln, p. 537 (Albany Evening Journal, July 1864). Alonzo Rothschild, Lincoln: Master of Men: A Study in Character, p. 200. Frederick J. Blue, Salmon P. Chase: A Life in Politics, p. 121. Rufus Rockwell Wilson, Intimate Memories of Lincoln, p. 346-347 (From Thurlow Weed, Autobiography of Thurlow Weed). Rufus Rockwell Wilson, Intimate Memories of Lincoln, p. 347 (From Thurlow Weed, Autobiography of Thurlow Weed). Maunsell B. Field, Memories of Many Men and Some Women, p. 303. John Niven, Salmon P. Chase: A Biography, p. 240 (Letter from Charles A. Dana to Salmon P. Chase, February 22, 1861). Albert Bushnell Hart, Salmon Portland Chase, p. 217-218. Sidney David Brummer, Political History of New York State During the Period of the Civil War, p. 136-137. David Donald, editor, Inside Lincoln’s Cabinet: The Civil War Diaries of Salmon P. Chase, p. 125 (September 8, 1862). David Donald, editor, Inside Lincoln’s Cabinet: The Civil War Diaries of Salmon P. Chase, p. 209 (October 5, 1863). David Donald, editor, Inside Lincoln’s Cabinet: The Civil War Diaries of Salmon P. Chase, p. 297. Alonzo Rothschild , Lincoln, Master of Men, p. 200. Ernest A. McKay, The Civil War and New York City, p. 236. Frederick J. Blue, Salmon P. Chase: A Life in Politics, p. 233. Albert Bushnell Hart, Salmon Portland Chase, p. 311. John Niven, Salmon P. Chase: A Biography, p. 362. Howard K. Beale, editor, The Diary of Edward Bates, p. 333 (February 13. 1864). Thomas Graham Belden and Marva Robins Belden, So Fell the Angels, p. 134. Thomas Graham Belden and Marva Robins Belden, So Fell the Angels, p. 102-103. Alonzo Rothschild, Lincoln, Master of Men, p. 200. Michael Burlingame and John R. Turner Ettlinger, editor, Inside Lincoln’s White House: The Complete Civil War Diary of John Hay, p. 92 (October 17, 1863). John Niven, Salmon P. Chase: A Biography, p. 352. Roy P. Basler, editor, The Collected Works of Abraham Lincoln, Volume VII, p. 120 (Letter to Salmon P. Chase, January 11, 1864). Roy P. Basler, editor, The Collected Works of Abraham Lincoln, Volume VII, p. 120 (Letter from Salmon P. Chase to Abraham Lincoln, January 12, 1864). John Niven, Salmon P. Chase: A Biography, p. 362-363. Roy P. Basler, editor, The Collected Works of Abraham Lincoln, Volume VII, p. 182 (Letter from Salmon P. Chase to Abraham Lincoln, February 12, 1864). Robert B. Warden, An Account of the Private Life and Public Services of Salmon Portland Chase, p. 556. Gideon Welles, Diary of Gideon Welles, Volume I, p. 514 (January 23, 1864). Maunsell B. Field, Memories of Many Men and Some Women, p. 304. Michael Burlingame and John R. Turner Ettlinger, editor, Inside Lincoln’s White House: The Complete Civil War Diary of John Hay, p. 93 (October 18, 1863). Roy P. Basler, editor, The Collected Works of Abraham Lincoln, Volume VII, p. 181 (Letter from Salmon P. Chase to Abraham Lincoln, February 12, 1864). Roy P. Basler, editor, The Collected Works of Abraham Lincoln, Volume VII, p. 182 (Letter to Salmon P. Chase, February 13, 1864). Roy P. Basler, editor, The Collected Works of Abraham Lincoln, Volume VII, p. 184 (Letter to Salmon P. Chase, February 15, 1864). Roy P. Basler, editor, The Collected Works of Abraham Lincoln, Volume VII, p. 184 (Letter from Salmon P. Chase to Abraham Lincoln, February 15, 1864). Roy P. Basler, editor, The Collected Works of Abraham Lincoln, Volume VII, p. 184 (Letter from Salmon P. Chase to Abraham Lincoln, February 18, 1864). Roy P. Basler, editor, The Collected Works of Abraham Lincoln, Volume VII, p. 195 (Letter to Salmon P. Chase, February 20, 1864). Roy P. Basler, editor, The Collected Works of Abraham Lincoln, Volume VII, p. 204 (Letter from Salmon P. Chase to Abraham Lincoln, February 25, 1864). Roy P. Basler, editor, The Collected Works of Abraham Lincoln, Volume VII, p. 213 (Letter to Salmon P. Chase, February 29, 1864). John Niven, Salmon P. Chase: A Biography, p. 363. John M. Taylor, William Henry Seward, p. 363. Frederick J. Blue, Salmon P. Chase, A Life in Politics, p. 241. John Niven, Salmon P. Chase: A Biography, p. 371.